Today is the 15th anniversary of 9/11. People ask each other "where were you on 9/11?" I was working for International Paper. We had a distribution center in Weehauken, New Jersey, right on the river. After news of the first plane hitting the towers, I called them. From their back loading dock, those associates watched the 2nd plane crash into the World Trade Center. Shortly after that I was told they were only taking phone calls from drivers who were making deliveries in Lower Manhattan that morning. Everything became so surreal. And then a plane flew into the Pentagon. 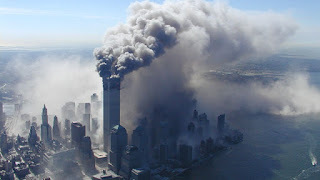 Looking back 15 years later, I am amazed at how totally unprepared our government was, I mean let's talk about getting caught with your pants totally down. That was our arrogance. Recently released information shows just how incompetent our leaders were, I mean we went to DEFCON 3 and were ready to deploy bombers with nuclear warheads without actually knowing what was happening. We were so close to World War III because those in power failed to follow the rules. Communication lines fell apart. They couldn't even talk to each other. It was Condoleeza Rice, from a bunker in Washington, who finally got through to Moscow because they thought we were ready to launch. We were really close to Armageddon. 9/11 needs to be remembered not only for its horror, and its tragedy, but also because hatred came close to changing the game, to dictating the rules, to initiating a reaction which would have altered the lives of billions of people. Even though it happened here, we need to remember this was an attack on the world. It was not the American Trade Center, or the United States Trade Center those planes flew into, it was the World Trade Center, and if anything like it ever happens again, we damn well need to be better prepared. I just read this today - wandered over here from Going Gently - and I like your analysis of the chaos 15 years ago and your emphasis on WORLD Trade Center. Thanks, sometimes our perspective is so self centered we fail to understand anything else.